Easy to order and delivery ideal. This was the first time I used this company and would recommend it. .. So, you’ve been home a couple of weeks now. You’ve gotten the hang of feeding and sleeping, you’ve probably figured out how to get a quick hot drink at least once in the day and, if you’re really lucky, you’ve even found a way to fit in a shower. Then the time comes to venture out of the house and, if you have a winter baby like me, there’s a whole new world to figure out. What should you dress your baby in? From what I have learned so far it seems that layers are your friend. Especially in the British winter. Sub zero temperatures one week then 18 degrees the next. In those few very cold weeks in January it was easy. A snugglesuit kept her warm and cosy. Now it’s spring, it’s a little harder. It’s cold, sometimes windy and rainy, but when that sun is out it can actually feel quite warm. So it’s good to be able to have the option to take off a layer or two when you feel your baby is getting a little warm. This is also really handy if you’re in and out of places so your baby doesn’t get too warm while you’re indoors. If you dress your baby in wool then there’s also the added benefit of the temperature regulating properties that comes with it. Wool has the ability to transfer heat and moisture into the cooler environment so baby should stay snug without overheating. Brilliant! If you’re like me though, you may have some preconceived ideas about clothes made from wool. I imagined the clothes to be old fashioned and bulky, and, I envisaged myself stood at the sink every day wringing out masses of hand washed clothes. But this hasn’t been the case and I’ve been thoroughly converted. I definitely stress less now about what she's wearing when we go out. Sometimes I worry that she's getting warm when we go indoors but I'm confident enough now to actually remove her from her pram in public so I can take a layer off if needs be. Most of the time it's just lifting her blanket off her though, which is much easier and less likely to disturb her because nobody wants to wake a sleeping baby. The blanket is definitely the ultimate layer! As with everything it just comes with practice and experience so maybe I'll know what I'm doing soon! Disana dungarees in Organic Merino Wool - These are gorgeous! In my opinion, this piece of clothing has it all. They are soft and stretchy so I know my baby will be comfortable in them. 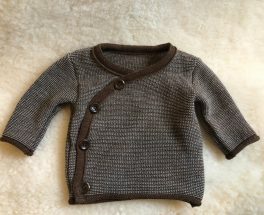 Disana Baby Jumper in Organic Merino Wool - I love this jumper. I know she’ll be lovely in warm so I don’t need to worry in those lower temperatures but it’s also soft so she’s comfortable in it too. I used to put it over a sleep suit and it never looked bulky. Disana Wrap Baby Cardigan in Organic Merino Wool - Like the jumper but much easier to put on! I don't seem to have a picture of her wearing this cardigan. Will definitely have to rectify this at first opportunity. You can't have too many pictures can you? 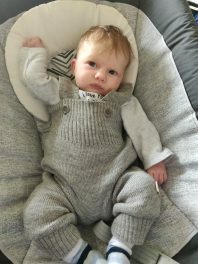 Wrap baby body in organic cotton with fold over scratch mitts - Baby body’s with built in scratch mitts are genius. They eliminate the need for scratch mitts which I guarantee you will lose at least once. Premature and Newborn Baby pants with feet by Serendipity - Trousers with built in feet! I had no idea these even existed but I’m so glad they do. I love them because it means your baby can wear something other than a sleep suit for a change but still have their precious little feet covered. They also eliminate the need for socks which, again, I guarantee you will lose at least once. This entry was posted on Friday, March 22nd, 2019 at 11:25 am	and is filed under Cambridge Baby Blog. You can follow any responses to this entry through the RSS 2.0 feed. You can leave a response, or trackback from your own site. Love reading about your wonderful daughter and so pleased things are going well for you all. We would add a Disana sleeping bag – basic one, is fab and theyre very generous. Also the Engel snugglesuit is easy to put on and very suitable for the carseat and sling. The Disana wool nappy cover/ shorts are great even over a disposable nappy to help little bottoms breathe. Thank you Tracey! Molly has a Disana sleeping bag and nappy cover, but we haven’t had a chance to use either of them yet. She is still a bit small for the sleeping bag and we haven’t got round to lanolising the nappy cover yet! Did you lanolise yours? We advise customers to do so on the website, but some have feedback saying it wasn’t necessary. If you are using over a cloth nappy to prevent wetness seeping onto babies clothes then it will need lanolising at least twice, but we have used over a disposable at night to prevent the smallish leaks you sometimes get with disposables and I felt it may help air circulate better, then they don’t need lanolising. They are so cute and soft and keep babies very snug and comfortable at night. Thanks, that’s very helpful. She’s just started wearing her reusable nappies now they fit a bit better. Having a few leaks so will probably lanolise the cover just to make sure!